DJ Gribbin, left, President Trump's special assistant for infrastructure policy, is leaving the administration after a rough rollout of his proposals. Trump initially promised he'd deliver a trillion-dollar infrastructure plan in his first 100 days, but it took more than a year until Gribbin and the White House would unveil and deliver the plan to Congress in February. 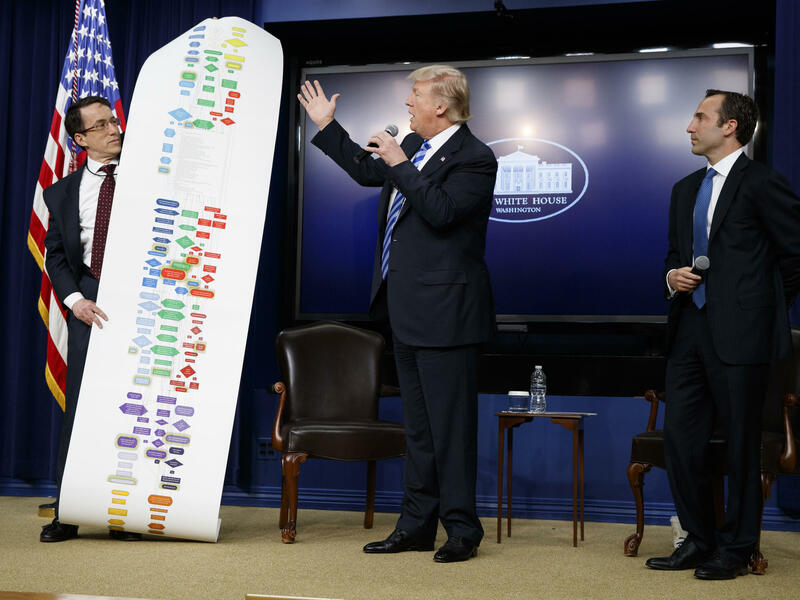 And the president upped the ante, calling it "the biggest and boldest infrastructure plan in the last half-century," promising it would generate a $1.5 trillion investment in rebuilding the nation's highway, railways, bridges, tunnels, airports, seaports and water systems. Gribbin told NPR's All Things Considered that America is up to the task. "It's apparent that cities and states and counties are eager to invest more in infrastructure," he said. And he pushed back on the notion that the administration can't ask state and local taxpayers for such funding, when a much a bigger federal investment in infrastructure is long overdue. "All of these funds come from taxpayers — right?" said Gribbin. "And if you go out and you ask the public, you know, where do they want to invest? They have much more confidence if they write a check locally that that money will be spent in a way that they can be held accountable for than if they send a check to Washington." He also added in a briefing for reporters that "this is in no way, shape or form ... a take-it-or-leave-it proposal. This is the start of a negotiation." And White House officials added that "the president has said he is open to new sources of [federal] funding," including an increase in the gas tax. "We want it to be bipartisan." At an event to promote the infrastructure plan in Ohio last week, Trump went off script and acknowledged his plan to rebuild and repair the nation's roads and bridges isn't going anywhere fast, telling the crowd, "you'll probably have to wait until after the election" in November.